Barbados Government withholds hotel’s VAT refund for two years. Punishment for owner’s activism or Barbados lacks money to pay? Government’s revenge on a foreign investor and business owner? On or before the 15th March 2013, we will be expected to pay over to Government the amount of $37,526.60 in Corporation taxes due for the last financial year. If we do not pay on time, then there will be an immediate fine of 5 per cent of the amount due, which equates to $1,876.33 plus interest accrued of 1 per cent per month or 18 per cent annually, which is 3 times the latest rate of Government borrowings to sustain a bloated public service and pay for dismally failed projects like GEMS (Hotels and Resorts Limited) and the chartering of Carnival Destiny for CWC2007. As a small business that has operated on Barbados for twenty five years and that is fully paid up with all our statuatory obligations, it is a significant amount of money. Yet the same Government has owed us outstanding VAT refunds of nearly $30,000 for up to two years. Of course they have not paid us any late penalty charges or interest. Before going public, I have written personally to the Ministers of the various Government bodies involved, but up until today, not received any form of response. It appears they feel they have no obligation to businesses that are successful, sustainable (through there own efforts) and those who have demonstrated viability over decades of operation. Why so many Barbados condo projects? The answer will shock some investors. Condos here, condos there. Half finished, never finished condos everywhere! New foreign investor arrives in Barbados! The reason why condos continue to be built in Barbados has nothing whatsoever to do with the ability to sell them. They are built because someone, largely overseas developer investors, will invest in their construction. The real estate agents give inflated projections on sales at inflated prices, the local contractors and design consultants reinforce these mistaken projections – the developer investors see profit. The development gets built, everyone makes money with the exception of the developer investor. Some projects never even get to completion. The problem is the caliber of developer – most are ego investors – business men made good in some other business, who listen to the siren call of the “Barbados Building Machine”. Once the beast is fed and the financial life blood drained from the investor they are discarded until the next fool steps of an airplane. One way to stop this nonsense would be to require fully audited development business plans to be a condition of the granting of planning permission – then 25% open market sales before the construction can commence. That would identify and kill-off the unsustainable schemes. As a successful business person, Canadian Peter Allard always tries to give something back to the world. Whether it is funding medical research into cancer, diabetes and HIV/Aids, establishing University scholarships, rebuilding the coastal reefs in Barbados, saving endangered species in St. Vincent, helping to form a National Park in Dominica, promoting social justice causes or working to save children and families devastated by HIV/Aids in Africa – Peter Allard is there. “Two decades ago, Peter Allard fell in love with the Caribbean country of Barbados and the Bajan people who make this such a special place. As he had in other countries both rich and poor, he thought he could work with those in government to make a difference in the lives of ordinary people. By the time Canadian philanthropist and businessman Peter Allard arrived in Barbados more than twenty years ago, a huge section of Graeme Hall swamp on our south coast was little more than a festering garbage dump waiting to be filled in and paved over. I remember as a child riding by the swamp and seeing men tipping an old refrigerator and other rubbish at the eastern pathways. What a stinking mess the place was with piles of household rubbish, construction demolition materials and rusting chemical barrels everywhere. Not to mention hundreds of plastic bags blowing in the tall grasses like little flags! But mess or not, property developers had their eyes on the shrinking Graeme Hall wetlands and watershed because it was the last large tract on the southern coast. There was talk of condominiums and a golf course, a gated community and an industrial section in the north end. As still happens all the time throughout the island, certain political and business cartels that have no concern for the public good or the need for green space decided that Graeme Hall would be developed and with the help of their friends in government they would make a fortune. Land Permissions: Money in the bank for the government and special friends! 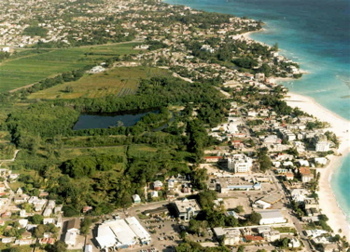 Land permissions are everything in Barbados. If the developers purchase land for cheap because development is prohibited, but they already have agreed with their government friends to change the law to allow development – well, fortunes are made overnight! That’s the way it is here. Always has been that way and if you are among the privileged Bajan political and business elites who have an “in” this is how millions are created out of nothing – often overnight on the basis of one signature with authority to allow development. Of course, if you’re the poor farmer who sold your land for nothing because you were denied permission to develop for 30 years and then the permissions are given the week after you sold out to one of the big shot BLP or DLP lawyers – well, that’s tough for you! Welcome to the “soft corruption” of the Barbados elites that makes millions overnight for those with “friends” and keeps the ordinary people down where they belong. 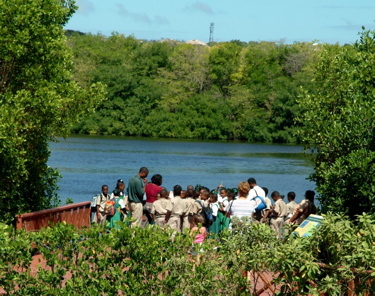 The last remaining mangrove wetlands in the island would surely have been developed and met the same fate as all the other Bajan mangrove swamps had not the environmentally-minded Peter Allard in conjunction with like-thinking Barbadians believed that this precious natural treasure was worth saving for the Bajan people. Nope, Allard didn’t act alone. Hundreds and then thousands of good Bajan citizens welcomed the plan to save some natural heritage and provide some green space, as did many of the politicians and other community leaders at the time. Allard and the citizens and the planners met with the government and received assurances that if the mangrove swamp and wetlands were restored and saved by Allard’s cash, it would be protected for all time for Bajans as the natural treasure it is. The nature sanctuary was the showpiece that made the Graeme Hall area a national tourism asset. It provided the organisational base to perpetuate knowledge and made resources available to continue to restore and protect Graeme Hall wetlands as a natural public treasure. In later years the nature sanctuary became almost self-supporting through tourism and hosting special events, but the shortfall as well as the development and construction costs came out of Allard’s pocket. Ahhhh…. but leaving parts of the wetlands out of the RAMSAR treaty was a deliberate strategic move by the elites who knew all along what their goals were. The government’s apparent commitment to preserve the natural area lasted only until Allard had spent US$35 million or so saving the Graeme Hall watershed and wetlands – and establishing the Graeme Hall Nature Sanctuary as a world-class eco-tourism facility. After assuring Allard and the thousands of Bajans who supported saving our wetlands that this area was protected in law, and after Allard invested tens of millions, the elites decided to CHANGE THE LAW TO ALLOW DEVELOPMENT!